Specializing in Lionel postwar and modern, MTH, K-line and other O-gauge model trains, accessories and switches. Also buying model train collections. Specializing in postwar Lionel trains. Service and repairs are available. Engines, rolling stock, passenger sets, accessories, and original boxes for sale. An archives section provides free information. Order by phone, fax, mail, or email. Deals with all Lionel products and repairs. Buy and sell your Lionel, and all gauges of trains. An authorized Lionel Dealer. Order by email. Specializes in Lionel Trains(99 years old) and has post and prewar trains. Also purchases old trains and entire collections. Order by phone. Lionel parts for sale to repair your Lionel trains. Original and reproduction parts from postwar to LTI. Order by email. Carries Lionel, American Flyer, MTH, Atlas 'O', Aristo-Craft , LGB, Athearn, Model Power, Learning Curve, Thomas and Friends, Brio trains, parts, and accessories. Authorized dealer and service station for Lionel, MTH, LGB, and American Flyer. Source for over 100,000 different model trains and model railroading products in all scales including toy trains, Lionel, train sets, books, videos, and software. For the largest selection of new and older Lionel, MTH, LGB, and all other major manufacturers of toy trains. Specializing in custom painting and detailing for model trains. Complete selection of N, HO, O, and Lionel scales. Specializing in wooden trains including Thomas the Tank Engine, BRIO, Lionel, Alphazoo, Whittle, and Suretrack. An authorized Lionel value added dealer for classic trains. Carries a full line of new and used trains, building kits, and accessories. Carries a large selection of model trains, and accessories featuring LGB, Lionel, MTH, RailKing, K-Line, Atlas, Williams and Weaver. Order by phone or fax. Books and videos on toy trains such as Lionel. Also, sells toy trains. Lionel, American Flyer, Marx, and Ives toy trains. Retailer of MTH, Lionel and LGB model trains. Model railroad and garden railroad supplies from LGB, Aristo Craft, USA Trains, Hartland Locomotive Works, Lionel, K-Line, Woodland Scenics, Kadee, Model Die Casting, Bachmann Trains, Piko, Pola, Model Power, Life Like, and Atlas. Offers a variety of collectibles and figurines such as Just the Right Shoe, Harmony Kingdom, Peanuts, Lionel trains, and lunch boxes. Supplier of quality postwar Lionel trains from 1945 - 1969. Order by phone, fax, email, or mail. Lionel, MTH and LGB trains. Madame Alexander dolls, preschool toys, construction toys, games, and puzzles. Collectibles for sale include Josef Originals, Marys Moo Moos, Wade, Friends of the Feather, Charming Tails, Pretty as A Picture, John Deere, and Lionel trains. Sales and repairs of O and O27 Lionel, K-Line, and Williams trains and accessories. Online inventory including pictures of all items and descriptions. Order by phone, email, or mail. 24 Jerry Quinn Classic Trains and Toys Coatesville, PA.
Coatesville, PA. Lionel and MTH authorized dealer, Repairs and restorations guaranteed for one year. Also Marx, American Flyer, Williams, and Plasticville. Order by email. This big resource for model-railroad products carries engines, cars, tracks and accessories for sets from all manufacturers in all gauges including Lionel, Athearn Genesis and Proto 2000 products. Collectibles include Barbie Dolls(Harley Davidson) Lionel trains, Beanie Babies, Handmade knives, Regimental & Mettlach steins, WW2 Memorablia and Ceramic Liquor decanters . Northern Californias model railroad store with a large selection of new brass, brass consignment, micro trains, LGB, Lionel, MTH, O scale, HO, N, and Z. Order by phone or email. Unused or secondhand European model trains. Buy from someone like you, a collector/operator of Marklin trains. American Flyer trains, parts and accessories, Gilbert toys and memorabilia. Large selection of new and used American Flyer trains and accessories. If the business hours of Grahams Trains in may vary on holidays like Valentine’s Day, Washington’s Birthday, St. Patrick’s Day, Easter, Easter eve and Mother’s day. We display standard opening hours and price ranges in our profile site. We recommend to check out grahamstrains.com for further information. 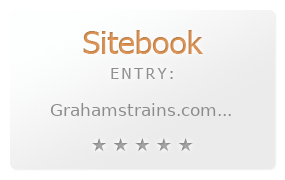 You can also search for Alternatives for grahamstrains.com on our Review Site Sitebook.org All trademarks are the property of their respective owners. If we should delete this entry, please send us a short E-Mail.